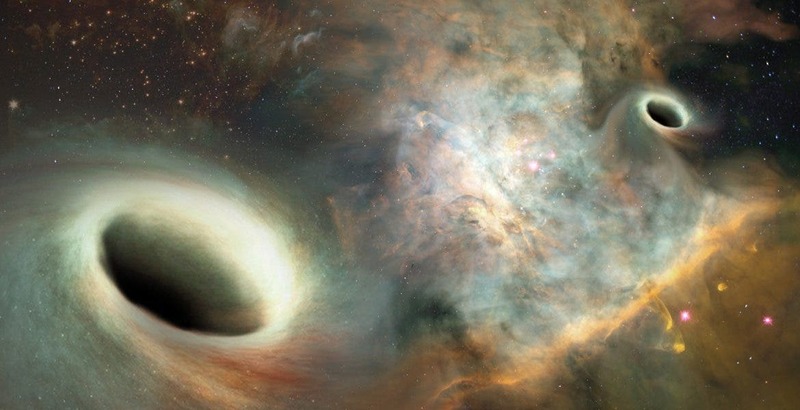 “This is the first time such strong evidence has been found for a pair of orbiting giant black holes,” said co-author Emily Levesque, a UW assistant professor of astronomy. As they report in a paper published online Nov. 20 in The Astrophysical Journal, astronomers from the University of Washington made this discovery using X-ray data from NASA’s Chandra X-ray Observatory and optical data from two ground-based telescopes, Gemini-North in Hawaii and the Palomar Transient Factory in California. This unusual source, called LGGS J004527.30+413254.3 (J0045+41 for short), was seen in optical and X-ray images of Andromeda, also known as M31. Until recently, scientists thought J0045+41 was an object within M31, a large spiral galaxy located relatively nearby at a distance of about 2.5 million light-years from Earth. The new data, however, revealed that J0045+41 was actually at a much greater distance, around 2.6 billion light-years from Earth. Even more intriguing than the large distance of J0045+41 is that it likely contains a pair of giant black holes in close orbit around each other. The estimated total mass for these two supermassive black holes is about two hundred million times the mass of our Sun. Previously, another team of astronomers had seen periodic variations in the optical light from J0045+41, and — believing it to be a member of M31 — classified it as a pair of stars that orbited around each other about once every 80 days. The intensity of the X-ray source observed by Chandra revealed that this original classification was incorrect. Rather, J0045+41 had to be either a binary system in M31 containing a neutron star or black hole that is pulling material from a companion — the sort of system Dorn-Wallenstein was originally searching for in M31 — or a much more massive and distant system that contains at least one rapidly growing supermassive black hole. However, a spectrum from the Gemini-North telescope taken by the UW team showed that J0045+41 must host at least one supermassive black hole and allowed the researchers to estimate the distance. The spectrum also provided possible evidence that a second black hole was present in J0045+41 and moving at a different velocity from the first, as expected if the two black holes are orbiting each other. The team then used optical data from the Palomar Transient Factory to search for periodic variations in the light from J0045+41. They found several periods in J0045+41, including ones at about 80 and 320 days. The ratio between these periods matches that predicted by theoretical work on the dynamics of two giant black holes orbiting each other. The researchers estimate that the two putative black holes orbit each other with a separation of only a few hundred times the distance between the Earth and the Sun. This corresponds to less than one hundredth of a light-year. For comparison, the nearest star to our Sun is about four light-years away. Such a system could be formed as a consequence of the merger, billions of years earlier, of two galaxies that each contained a supermassive black hole. At their current close separation, the two black holes are inevitably being drawn closer together as they emit gravitational waves. If J0045+41 indeed contains two closely-orbiting black holes it will be emitting gravitational waves, however the signal would not be detectable with LIGO and Virgo. These ground-based facilities have detected the mergers of stellar-mass black holes weighing no more than about 60 Suns and, very recently, one between two neutron stars.